The ceramic plates are very easy to clean and don't take long to heat up. Most of these ceramic plates are scratch resistant and designed for heavy use. The non-stick material is applied to help prevent food particles and grease from sticking to the plates, so you won't have to spend time scrubbing the grill. You'll also hear these referred to as fat-reducing grills, since they allow the grease from meats to cook out of the food, and not be absorbed back into it, providing a “healthier” option for people that want to cut the fat. Overall, finding the best ceramic electric grill available might not be the easiest task, which is why you should take a moment to review our list of the top 5 best ceramic electric grills. Your final choice will allow you to cook a variety of foods, thanks to the versatility provided by these grills. The Evolve Grill by George Foreman might not be the most recent ceramic electric grill available, but it does offer all the advantages that these grills provide. The George Foreman brand is also one of the most recognized names in home grilling. This grill can be set flat or placed on a slope. The natural incline of the grill helps drain excess fat from the cooking meats. George Foreman grills have been known to cut out a tremendous amount of fat from food, and this unit is no different. In addition to the grill features, it also comes with waffle plates. 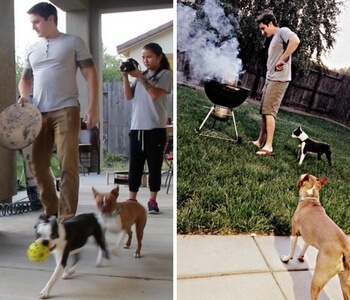 The Evolve Grill is great for large families. You can cook up to 5 servings at once with its 75-square inches of cooking surface. The best thing about this grill is that you can cook several types of foods at once so if you’re using it for a party or gathering you will be prepared. When you’re ready to clean up, you can simply put the ceramic cooking plates in the dishwasher, so you can enjoy the rest of your day. This is an older model and may lack some of the features of newer grills, such as advanced heating technology, but it does offer several advantages. These advantages include the affordable price, digital control panel, and removable ceramic cooking plates. The next option comes from Hamilton Beach. The first benefit to explore is the 200-square inch cooking surface. If you have a large family, this grill has you covered. The nonstick coating used on the ceramic plates can last up to 4 times as long as traditional nonstick pans. The surface can also be wiped down easily. There is no need to worry about your grilling plate cracking or peeling. This grill has a slim size that can fit into any kitchen, but there are some downsides. 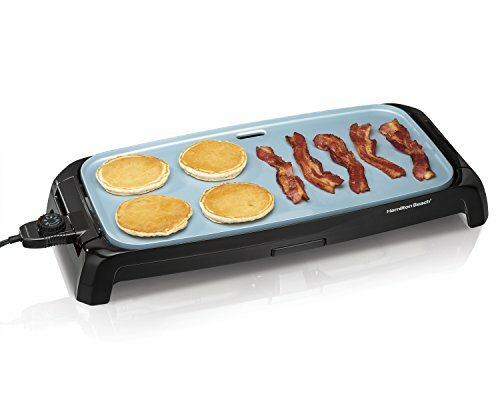 The most evident issue with this grill is that it only has a griddle/flat surface. Granted, you can still use that cooking surface to cook burgers, hot dogs, chicken, and steak, but it doesn't create the grill marks that are associated with grilled foods. For die-hard grilling enthusiasts, the flat plates may be a turn-off. This also may not be the most durable grill available, but it is relatively inexpensive. It provides an affordable option for adding a ceramic electric grill to your kitchen. Clean up is also easy, using the included drip tray. 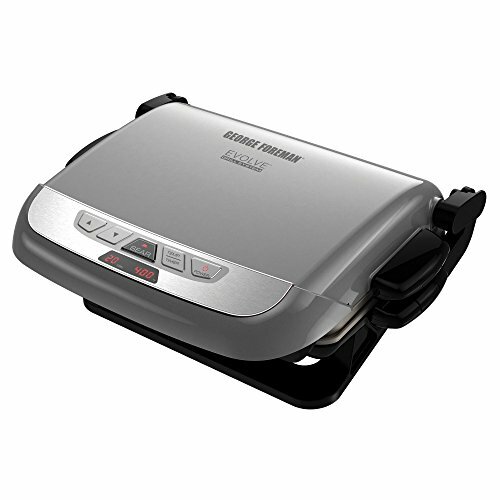 The George Foreman GRP4842P ceramic grill has 3 functions – it can grill or cook paninis and waffles. These options will keep you prepared for every meal of the day. The digital control panel makes this grill easy to use. The panel displays the cooking time and temperature of the grill, so it's easier to monitor your food and avoid under or over-cooking. The cooking plates have an advanced nonstick multi-layer ceramic coating that will reduce the amount of time spent cleaning after you cook. Also, the cooking grill plates are removable, so you can easily throw them in the dishwasher. With the cool-touch release, you can remove the plates even if you were just cooking on the unit minutes prior. Unlike most electric grills, this ceramic grill heats up quickly. The George Foreman brand offers a 500-degree searing burst which essentially raises the grill’s temperature to 500-degrees for about 90 seconds. The standard cooking temperature range for this grill is between 325 and 450-degrees. 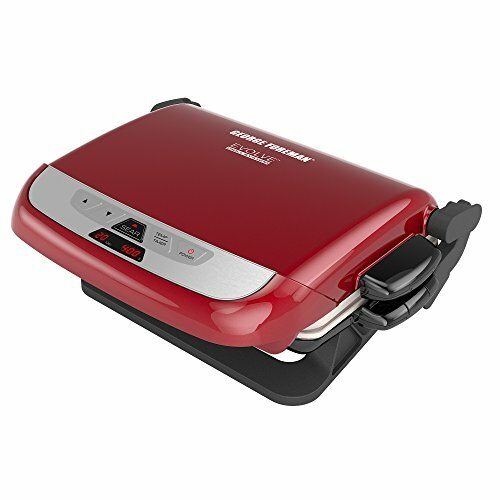 If you like to stray from the traditional black grill color, you can also choose from red and silver if you choose. These additional options will be great if you want to match with kitchen accessories or if you have a favorite color. The De’Longhi CGH902C 5-in-1 Ceramic grill is a versatile cooking unit that will make things much easier for you on both the cooking end and the cleaning end. The high precision temperature controls ensure you are in full control of the heat while cooking your favorite grilled foods, such as chicken, steak, and burgers. This grill is made with Durastone coated ceramic plates that are meant to last a long time, especially since they are resistant to scratches. This means that you’ll be able to just throw the plates into the dishwasher and not have to worry about your ceramic plates coming out looking worn and ugly. Speaking of removing the plates, there is a quick-release button on the grill to make plate removal easy. One of the best things about this ceramic grill is its versatility; it can essentially be used for anything. 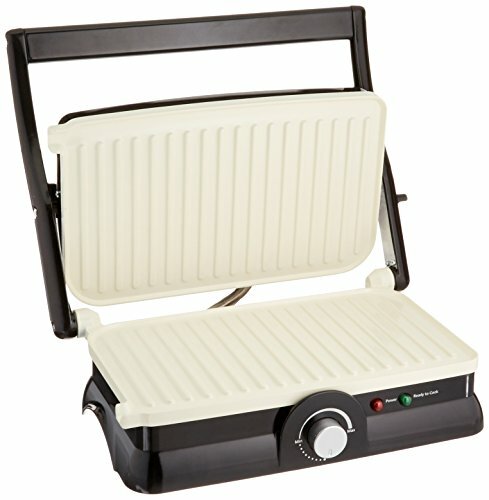 The 5-in-1 ceramic coated grill can be used as a full grill, a full griddle, a panini maker, or half grill/ half griddle. This will give you more opportunities to spice up what’s going on in the kitchen instead of getting bored cooking the same type of foods day in and day out. As for most electric indoor grills with two sides, heating up might take a while, but cooking will be fast as you can press the meat so that you can cook both sides simultaneously. This last option is perfect for someone on a budget looking for a great ceramic electric grill. The DuraCeramic non-stick ceramic coating proves to be up to 4 times more durable than the traditional grill, so you won’t need to worry about paint flaking or peeling onto your food. Another advantage is that this grill can heat up and cook food up to 20% faster than the average electric grill, saving both time and electricity. There are also a few features of this Oster ceramic electric grill that make cleaning easier. The ceramic coating on the grill’s plates are free of any chemicals and are very easy to wipe down. You won’t have to deal with food particles or grease sticking onto the plate. If there is one disadvantage, it would be turning the grill on and shutting it off. This grill does not feature an on/off button. Instead, you get a temperature dial. This is not a major issue, but may be an inconvenience for some buyers. Now that we went through the list of the top 5 ceramic electric grills, it's time to figure out to make your final selection. All 5 options are similar, which can result in a difficult buying decision. The main two areas to pay attention to include the price of the grill and the versatility. If you're on a budget, you should consider Oster DuraCeramic grill. This ceramic grill is reasonably affordable and comes with an equal number of features as other grills on this list of the top 5 ceramic grills. If you’re very serious about cutting fat from your meats using a ceramic electric grill, the George Foreman grills are your best options. These grills are specifically made to reduce the amount of fat retained within the food, so you can expect your meats to be lighter and healthier without drying out. These grills might be slightly more expensive than average, but at this point, you’re paying for a reliable brand that will give you the best ceramic electric grill available. 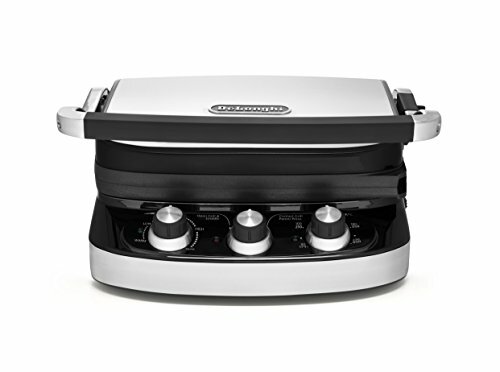 The most versatile grill is hands down the De’Longhi CGH902C 5-in-1 ceramic grill. Perfect for people who enjoy wide varieties of food, this grill can cook up plenty of different foods thanks to the 5 cooking plate combinations available to you. All 5 grills on this list can provide an exceptional grilling experience. The ceramic plates used for these grills are generally strong, easy to clean, and appealing to the eye. They’re made to handle any type of food, as often as you would like. Take advantage of this hardware by choosing the best grill for your current situation and start cooking. Learning a little more about ceramic electric grills can also help you make an informed decision. These grills are designed for indoor use and are powered via an electrical outlet. If you have used an electric grill before, then you know that you don't always get the same char taste that you can get on charcoal grills and select gas grills. If you love the char-grilled taste, don't worry, there are methods that can be applied to your food, so you can still experience this niche flavor. Different seasonings designed to recreate that smoke flavor will bring you back to that moment when you were eating at your local campsite. As we stated earlier, grills with ceramic plates are very easy to clean. After spending considerable time grilling, the last thing you’ll want to do is spend more time cleaning. Most of these grills have dishwasher-safe plates and nonstick surfaces. Clean up is a breeze, even if you don't have a dishwasher. The food will typically wipe right off. There are a few potential disadvantages to choosing a ceramic electric grill over an outdoor option, such as a natural gas grill or even a charcoal smoker/grill combo. If you plan on using your electric grill daily, you may notice an increase in your electricity bill. Though, any increase should be nominal. Another issue is the startup time. It can take longer for an electric grill to heat up compared to some of the other heating sources. This extra time is countered by the fact that the ceramic plates are easier to clean. Most of the grills on the list are designated “indoor” grills. This is because they are tabletop appliances that require access to a power outlet. If you have a porch outback and an outdoor power outlet or extension cord, then you could technically take the grill outdoors, but this is something that should be avoided if there is a chance of rain. The main benefits of choosing a ceramic electric grill are the convenience that they offer and their price tags. These appliances tend to be affordable compared to outdoor grills and they feature ceramic plates that are easy to clean. If you want to start grilling indoors, then consider getting a ceramic electric grill today.